What’s the worst thing about cycling in autumn and winter? We reckon it’s got to be the muck that accrues on your pride and joy. 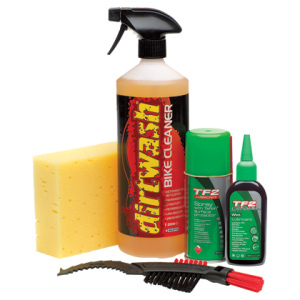 Thankfully, there’s never been a better time for bike cleaning products, and the selection of cleaning kits from Weldtite is a great place to start. For current conditions the Wet Cleaning Kit is just about all you need. It comes in a handy 4.9-litre bucket and includes a litre of Dirtwash bike cleaner, TF2 aerosol spray, some TF2 extreme wet lube, a sprocket brush and a sponge, all for a very reasonable £26.99. What’s the second worst thing about cycling at this time of year? The bits of flint and thorns that get washed or blown onto the road and cause you punctures. Again Weldtite is on the case. For £25.99 you can have the Wedge Bag Repair and Inflator Kit, a handy little saddlebag that comes ready filled with puncture repair goodies, such as Jetvalve tyre inflator with two CO2 cartridges, two tyre levers, and a Red Devil self seal puncture repair kit.